Already an old household name, Polaroid was the first company to make 3D printing “a part of everyone’s everyday life”. And to further that goal, the American electronics company announced a new range of 3D printers and 3D pens at CES 2017 today — all easy-to-use and priced affordably to make 3D printing commonplace. The products are aimed at consumers looking to easily create artwork, design jewellery or models, or just have some fun at home or in the office. There are three printers in the Polaroid 3D printers range — all of them sleek, compact and perfectly sized to fit into any home or small office, allowing any beginner to let their creative juices flow. The printers are controlled through apps available for both iOS and Android, and the build progress can be tracked via colour-coded lights. With a printing layer resolution of 100 microns, the printers use a 1.75mm filament that can be changed to suit the colours of a design. Most importantly, they all come with a child-safety lock during the printing process. Shake it like a Polaroid... err.. pen? 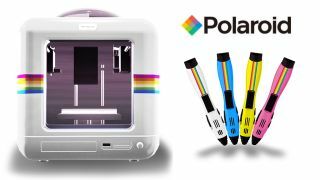 The two Polaroid 3D pens feature an ergonomic design and come with 10m of starter filament. The wireless pen also features a built-in battery and charging stand. And to make any creative project more fun, the products come in vibrant colours of pink, black, blue and white, with the addition of yellow for the pens. The Polaroid 3D printers will be available in US and Canada by July at an expected price point of between $499 and $799 (around £650/AU$1,100 for the premium model), while the pens will be in authorised retail stores in March and cost between $129 and $149 (around an average price £113/AU$192). So far, there's no word on when Polaroid's new products will be hitting shelves in the UK and Australia, but we'll keep you updated on any further details that arise. Keep up to date with all the happenings at CES 2017 straight from Las Vegas.